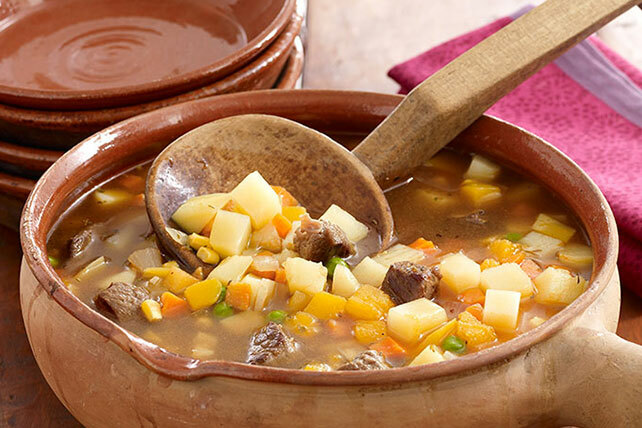 Hearty with red potatoes, butternut squash and cubes of tender beef, this Healthy Living stew is Chilean cooking at its best. Bring potatoes, squash and broth to boil in stockpot on medium-high heat; simmer on low heat 10 min. Meanwhile, cook meat, onions and garlic in dressing in large skillet on medium-high heat 5 min. or until meat is browned, stirring occasionally. Add seasonings; cook 5 min., stirring frequently. Add to potato mixture in stockpot; stir. Simmer 30 min., stirring occasionally. Stir in mixed vegetables; simmer 10 min., stirring occasionally. This traditional Chilean dish is often made with cochayuyo, a protein-packed dried seaweed. It is sold in bundles and is often used as a substitute for beef. It is a leafy seaweed. It's base is called "ulte" and the dried leaves are called "cochachuyo". Both parts are used in salads and fresh seafood preparations. The Chileans like to eat this stew with a fried egg served on top!